Game of Thrones is one of the most beautiful shows on television because of its expansive sets, elaborate costumes (and lack thereof), obsession with detail, intimidating weather and anything dealing with the world of Westeros. It's such a magnificent place that even if the characters disappeared I could watch the golden glow of King's Landing and the snowy Northern truth clash. But what if Game of Thrones was set somewhere else? Could it be... more beautiful? If it was set in feudal Japan, it just might be. Artist Sei-G reimagined Game of Thrones in feudal Japan and his woodblock prints work incredibly well. The colors pop, the battle sequences seem to cut deeper and the costumes that everyone wears seem like artwork on their own. The art of Sei-G is so considered, he uses the same characters that we know in Game of Thrones and remixes them with weapons, costumes, practices, etc. from feudal era Japan. Robert Baratheon and Rhaegar Targaryen that preceded the series by seventeen years. Instead of a war hammer, Robert wields a Kanabō, a club-like samurai bludgeoning weapon. His antlered helmet is inspired by the famous helmet of the warlord Honda Tadakatsu. Sei-G puts much thought into reframing the wildlings of Game of Thrones as the Ainu of Japan, indigenous people of northern Japan and people who lived independently from the Emperor. Other Japanese practices are added to the story of Game of Thrones too and I can't help but wonder how amazing a TV show set in feudal Japan with the stakes of Game of Thrones would be. 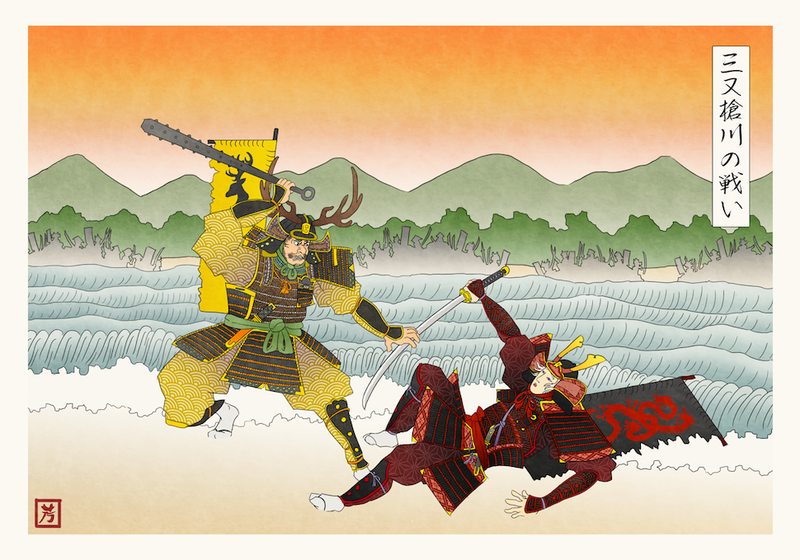 We'll probably never find out about that but you can buy Sei-G's Game of Thrones in feudal Japan prints here and pretend on your own. All of his prints are current to the show (with one print made with a scene from the season 4 trailer), so if you're behind you might encounter some TV show spoilers. Above shows Danaerys wearing Heian-period royal clothing with her dragons.